Desperate parents of a two-month-old baby born with part of her brain and skull missing have today begged for money for life-saving surgery. Ah Neath’s life is in the balance and her poverty-stricken family are now running out of time and hope that their daughter will survive. Her mother, Srey, and father, Heang, have frantically tried to scrape funds together and even sold their home to pay for medical care. However, doctors in Cambodia, where Ah and her family are from, have been unable to treat the condition. Her parents remain hopeful. 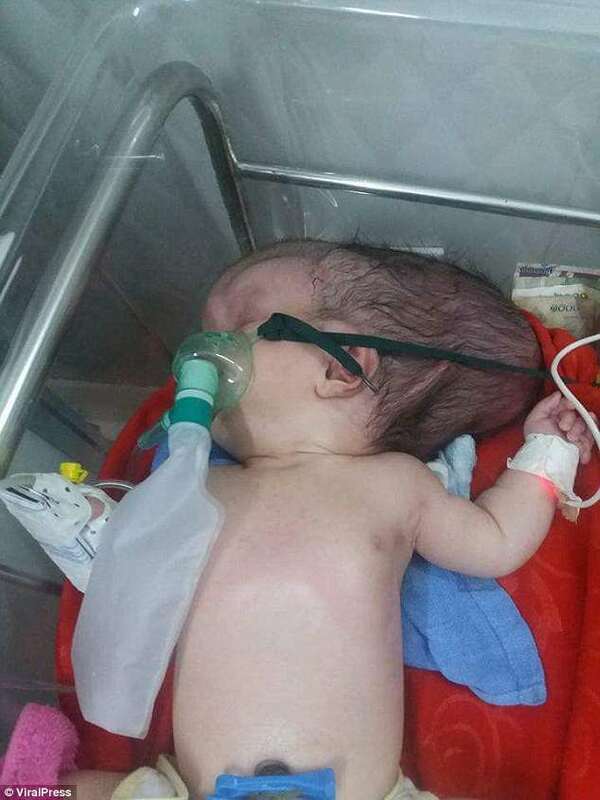 Medics in the South-East Asian country, between Thailand and Vietnam, believe the missing part of her skull may have been caused by anencephaly. 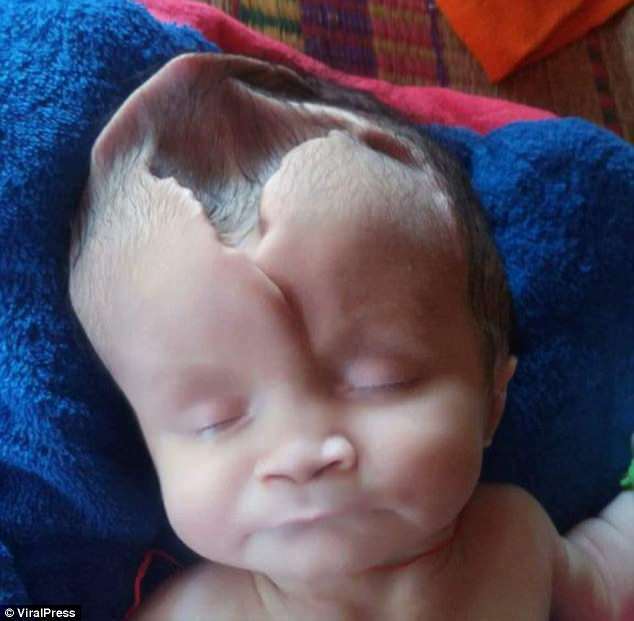 The rare condition, sometimes known as ‘open skull’, occurs when the fetus does not form completely while growing in the womb. Estimates suggest around one in 5,000 babies born each year will have the defect, which also robs them of part of their brain. Literature states there is no cure for anencephaly and officials at the US Centers for Disease Control warns babies to die shortly after birth. 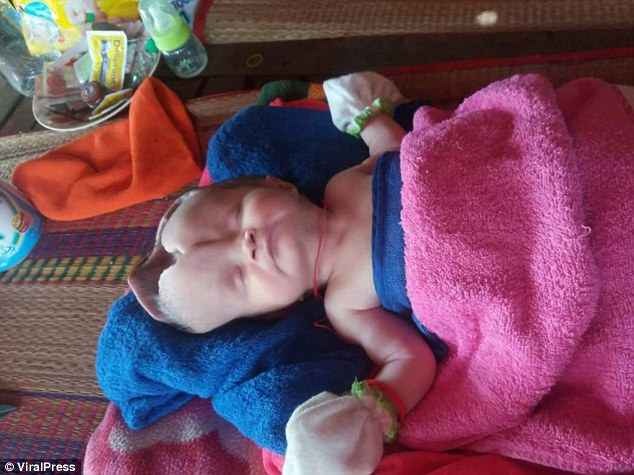 In a desperate attempt to try and save her daughter’s life, Srey has spoken of her fears that her baby girl will die without immediate medical help. She said: ‘I knew there was something very wrong with my baby when she was born. I have cried for days and asked people to donate money. ‘We are poor and have sold our home and land to try to save my daughter. She is healthy, but her head does not have all of the skull. 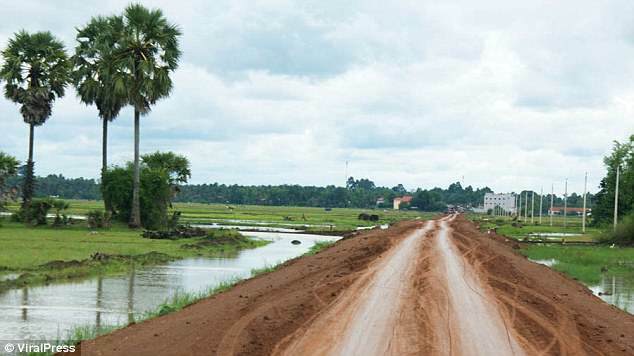 Ah was born in February in the remote Tbong Khmum Province – 103 miles (167km) northeast of the capital Phnom Penh. All of her limbs were working fine – but she had a huge crater in the top of her head and a large swelling at the back of it. She has been in hospital receiving oxygen to support her breathing but has now been discharged and is staying with family.